What is “Miss Kitty” mobile slot about? As the name implies, Miss Kitty is a slot designed around one main character – a cat. 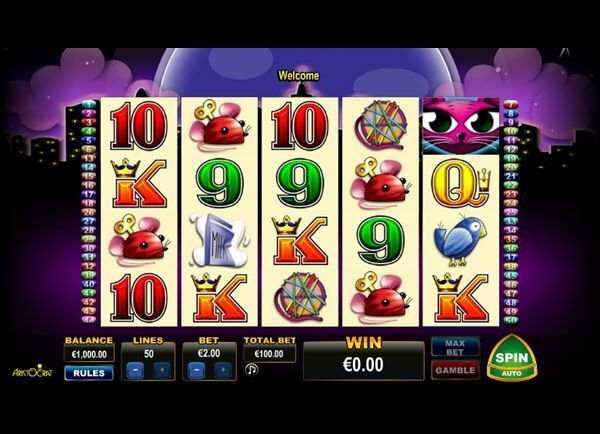 This 5-reel and 50-paylines online slot has been developed by Aristocrat. The game is very singular and offers a unique gaming experience thanks to the design, the predominant colours, the characters, the objects and the sounds. Cat themes may be popular, but Miss Kitty offers a new modern design. The main icons are all cat-related: balls of yearn, birds, cartons of milks, mouse, cats, etc. Thanks to HTML5 users can access the game from their mobile browsers and don’t need to download any app. The atmosphere is quite dark – the predominant colours are black, purple and pink. The funny face of a cat with long-lashes and big paws places the players in a nice environment. In the background users can see a skyline, which gives the impression of being in a dark modern city. While playing, you can hear casino style sounds as well as caterwauls. The main symbols for the players to watch out for are a full moon, the wild kitty, and the fish. The moons only appear on the first three reels. The wild symbols are only available on reels 2 to 5: the main character – Miss Kitty – will then appear. The fish appears stacked on all reels. The wild symbol can replace any missing symbols to complete a winning combination except the scatter symbol (the full moon). If the player gets all three full moons on his screen, they are awarded 10 free spins. When the can appears during the free games it is held in place for the remaining spins. The player will get extra free games if the three moon symbols appear again. As usual, the well-known Aristocrat developer allows players to use the gamble feature. Upon guessing the correct colour of a card, they have the opportunity to double all winnings and guessing the correct suit quadruples the winnings. The game features are well developed and numerous. This game is available for free play on numerous mobile devices and it is Mac-compatible. It can be used on players’ tablets, smartphones, iPhones and Android devices, which permits them to play at any time and anywhere thanks to their mobile. A pink cat and a huge bunch of paying lines.